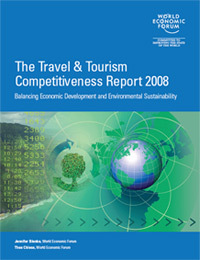 The Travel and Tourism Competitiveness Report was first published in 2007 by the World Economic Forum. The 2007 report covered 124 major and emerging economies. The 2008 report covered 130 countries, the 2009 report expanded to 133 countries, and the 2011 report to 139 countries. The index is a measurement of the factors that make it attractive to develop business in the travel and tourism industry of individual countries, rather than a measure of a country attractiveness as a tourist destination. The report ranks selected nations according to the Travel and Tourism Competitiveness Index (TTCI), which scores from 1 to 6 the performance of a given country in each specific subindex. The overall index is made of three main subindexes: (1) regulatory framework; (2) business environment and infrastructure; and (3) human, cultural, and natural resources. The Report also includes a specific Country Profile for each of the nations evaluated, with each of the scores received to estimate its TTCI, and complementary information regarding key economic indicators from the World Bank, and country indicators from the World Travel and Tourism Council. For the 2008 index, each of the three main subindexes is made of the scoring of the following 14 variables, called pillars in the TTC Report. Several changes were introduced in the 2008 TTCI in the definition of the variables as compared to the definitions of the 2007 TTCI. First, the “environmental regulation” pillar was improved with help from the IUCN and the UNWTO, and for the 2008 index was renamed the “environmental sustainability” pillar to “better reflect its components and to capture the increasingly recognized importance of sustainability in the sector’s development.” Second, the original pillar “natural and cultural resources” was divided into two separate subcomponents: “natural resources” and “cultural resources”, thus, allowing to differentiate those countries which do not necessarily have the same strengths or weaknesses in these two different resources. In general, the model was improved with better data and new concepts were introduced. The 2009 and 2011 reports kept the same 14 variables. The number in parentheses in the continent ranking corresponds to the position in the world's ranking for the overall index for 2011. The number in parentheses in the continent ranking corresponds to the position in the world's ranking for the overall index for 2009. The number in parentheses in the continent ranking corresponds to the position in the world's ranking for the overall index in 2008. ^ "The Travel & Tourism Competitiveness Report 2017" (PDF). World Economic Forum. April 2017. ^ "The Travel & Tourism Competitiveness Report 2015" (PDF). World Economic Forum. May 2015.